It offers all the tools necessary to open your favorite wine bottle with style - this is also why our corkscrew is so commonly bought by servers and waiters all around the world. The foil cutter on our wine opener is long, rounded and serrated to ensure removal of all foil types with ease. The foil cutter aligns with the rest of the wine opener when it's folded to avoid accidents. Removal of natural and synthetic corks is a breeze with our specially designed double corkscrew. Because of the double worm the wine opener will grip the cork firmly and make it less likely to break. The unique 2-step pull feature of this wine opener provide you with extra leverage and smoother pulling. This means you'll be able to handle long and tricky corks with ease. We've added a beer opener as an addition to the wine opener, because our research showed us that waiters and bartenders were looking to have one tool to handle both wine and beer bottles. NOTE : IF THE FOIL KNIFE IS DIFFICULT TO OPEN, SIMPLY APPLY A LITTLE BIT OF OIL AT THE KNIFE'S HINGES TO LOOSEN IT UP. THIS WILL USUALLY DO THE TRICK! PS: Wine bottle stopper sealer and vacuum pump feature combined all-in-one. Insert the stopper and pump the air 10-60 times depends on the rest wine, until the pumping rod rebounds, signals an air tight seal! 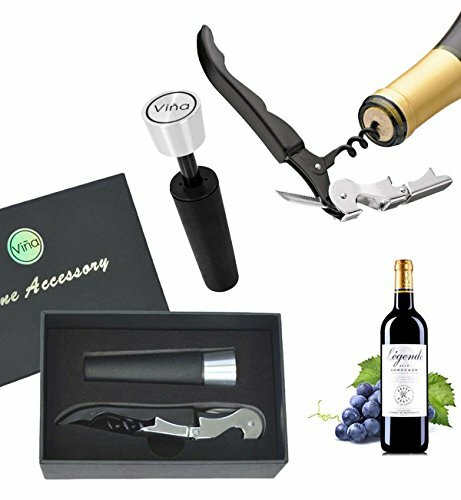 STOP WORRYING ABOUT CRUMBLED CORK AND BROKEN WINE OPENERS - You will be able to relax and enjoy opening your best wines with ease using our heavy duty wine opener especially when utilizing the classic double hinged fulcrum feature, with this you will be able to remove even the longest and most fragile corks. The corkscrew is the size of your hand and fits right into your pocket, it's the perfect tool for the wine lover, waiter, waitress or bartender. THIS WINE OPENER IS FOR THE PERSON WHO LOVES TO ENJOY A GOOD GLASS OF WINE - This wine opener is great for daily use and the more you use it the better it gets. When you learn the mechanics behind the double-hinged fulcrum you'll be able to remove wine corks in seconds. Once the cork is removed you simply close the corkscrew and store it until next time you wish to open a bottle. If you wish to clean the wine opener simply wipe it clean using a kitchen towel, that's how simple it is. THE UNIQUE AND EXQUISITE BARVIVO PACKAGING MAKES THE PERFECT GIFT - Imagine walking into your very best friends' birthday party and handing him this stunning decorative gift box. It will be a great ice breaker for people and make an excellent topic of conversation at the party. But what's even better is that you will have everything you need to help open some amazing wines and get the party started right at the spot. CUSTOMER CARE PROMISE- VINA always provide excellent product and service to our customer. For any reason you aren't satisfied with the salt and pepper mill set, we will replace or refund your money,CONTACT US directly and we will take care of you. We love to help! A GREAT VALUE ALL-IN-ONE WINE OPENER： Don't let the price fool you, this is a fantastic sommelier inspired, premium quality and durable 3 in 1 multi-function waiters key. This corkscrew elegantly blends the features of a wine corkscrew, bottle opener and foil cutter all together in a stylish and DURABLE 420 STAINLESS STEEL body with comfort-grip wood handle. It inspires confidence and offers the satisfying, solid heft of a fine tool and feels good in the hand, like a well-balanced kitchen knife. If you have any questions about this product by Vina, contact us by completing and submitting the form below. If you are looking for a specif part number, please include it with your message. Street Tribe Galvanized Alloy Rabbit Head Style Wine Bottle Opener.